An earlier independent work by Shinkai Makoto, the creator of Hoshi no Koe. Created in early summer 1999 using hand-drawn technique combined with 3D Software and AfterEffects for composition. The whole volume is colorless in order to reduce the burden of machine and to speed up production process. 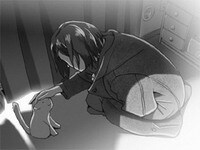 In this short animated work, Shinkai Makoto tried to convey a small warmth, vague lonesomeness of living, faint feeling into image and sound.